Summary Single bay Marvell-based NAS with USB and eSATA ports. A few weeks back, we looked at Synology's most inexpensive NAS, the DS115j. 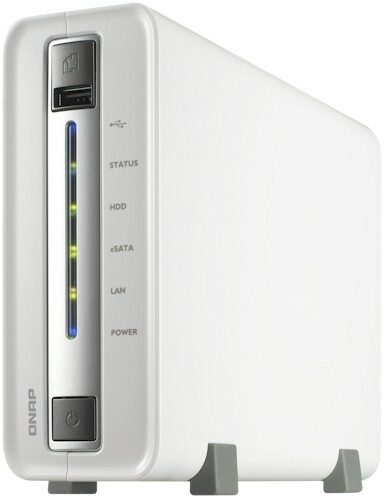 In the closing, we promised a review of QNAP's equivalent cheapest NAS, so here it is. The TS-112P Turbo NAS supports the same features as its more expensive siblings (RAID support excepted, of course). It's the least expensive option in QNAP's entry-level Home and SOHO line, which includes the TS-112P, TS-120 (~$125) and new TS-131 (~$170). There's also the SMB entry level single-bay TS-121 (~$215) if you want to spend a lot more. The 112P's specs look most like the TS-120. The main difference is the 112P doesn't have a hot-swappable drive bay and only accepts 3.5" drives. Note none of the single-bay models have HDMI ports. That's ok, because they don't have the processing poop to support video anyway. Unlike the Synology DS115j that has only USB 2.0 ports, QNAP endowed the 112P with two USB 3.0 and one eSATA port to go along with the single front-mounted USB 2.0 port. I couldn't find any callout diagrams in the hardware documentation, so you'll have to settle for unadorned front and rear panel views below. Since you have to install a drive, QNAP ships the 112P without the cover screws installed. So it was easy to slide back the cover and snap the photo below. Because this is going back to Amazon when I'm done, I didn't disassemble it any further. Fortunately, QNAP calls out processor, RAM and flash capacities right in the product spec. The Ethernet PHY is an educated guess, based on the TS-420's components. The table below shows the Synology DS115j for comparison. I used one of our WD Red 3 TB (WD30EFRX) drives for testing, which brought total power consumption to 10 W with the drive spun up and 6 W with it spun down. The little fan didn't have much work to do to keep things cool; noise was rated Very Low.